The earned income tax credit provides a boost to workers, their families and the communities where they live. A tax credit usually means more money in the taxpayer’s pocket. Many qualified taxpayers don’t claim this credit simply because they don’t know about it. In fact, every year millions of people are newly eligible for EITC because their family or financial situation changed. Word of mouth is one way to spread information about this credit. IRS.gov: Taxpayers who want to learn more about EITC can go to IRS.gov/eitc. They can find information about who qualifies for the credit and how to claim it. EITC Assistant: This tool on IRS.gov, available in English or Spanish, walks people through a series of questions to find out if they qualify. IRS on Social media: Share a link on Facebook or Twitter. People can follow the IRS on social media for the latest news and information about tax credits. Volunteer Income Tax Assistance: This program is also known as VITA. It offers free tax return preparation to eligible taxpayers who generally earn $54,000 or less. Tax Counseling for the Elderly: TCE is mainly for people age 60 or older, but offers service to all taxpayers. The program focuses on tax issues unique to seniors. AARP participates in the TCE program through AARP Tax-Aide. Taxpayers who are looking for a new job that is in the same line of work may be able to deduct some job-hunting expenses on their federal income tax return, even if they don’t get a new job. Same Occupation. Expenses are tax deductible when the job search is in a taxpayer’s current line of work. Résumé Costs. Costs associated in preparing and mailing a résumé are tax deductible. Travel Expenses. Travel costs to look for a new job are deductible. Expenses including transportation, meals and lodging are deductible if the trip is mainly to look for a new job. Some costs are still deductible even if looking for a job is not the main purpose of the trip. Placement Agency. Job placement or employment agency fees are deductible. Reimbursed Costs. If an employer or other party reimburses search related expenses, like agency fees, they are not deductible. Schedule A. Report job search expenses on Schedule A of a 1040 tax return and claim them as miscellaneous deductions. The total miscellaneous deductions cannot be more than two percent of adjusted gross income. Are looking for a job for the first time. For more on job hunting, refer to Publication 529, Miscellaneous Deductions. IRS tax forms and publications are available any time on IRS.gov/forms. Every taxpayer has a set of fundamental rights and the IRS has an obligation to protect them. The “Taxpayer Bill of Rights” groups the taxpayer rights found in the tax code into 10 categories. Know these rights when interacting with the IRS. A good way to learn about them is by reading Publication 1, Your Rights as a Taxpayer. The Right to Be Informed. Taxpayers have the right to know what to do in order to comply with the tax laws. They are entitled to clear explanations of the laws and IRS procedures on all tax forms, instructions, publications, notices and correspondence. They have the right to know about IRS decisions affecting their accounts and receive clear explanations of the outcomes. The Right to Quality Service. Taxpayers have the right to receive prompt, courteous and professional assistance in their interactions with the IRS. They also have the right to be spoken to in a way they can easily understand, to receive clear and easily understandable communications from the IRS, and to speak to a supervisor about inadequate service. The Right to Pay No More Than the Correct Amount of Tax. Taxpayers have the right to pay only the amount of tax legally due, including interest and penalties and to have the IRS apply all tax payments properly. The Right to Challenge the IRS’s Position and Be Heard.Taxpayers have the right to raise objections and provide additional documentation in response to formal IRS actions or proposed actions. They also have the right to expect the IRS to consider their timely objections promptly and fairly and to receive a response if the IRS does not agree with their position. The Right to Appeal an IRS Decision in an Independent Forum.Taxpayers are entitled to a fair and impartial administrative appeal of most IRS decisions, including many penalties and have the right to receive a written response regarding the Office of Appeals’ a decision. Taxpayers generally have the right to take their cases to court. The Right to Finality. Taxpayers have the right to know the maximum amount of time they have to challenge an IRS position as well as the amount of time the IRS has to audit a particular tax year or collect a tax debt. Taxpayers have the right to know when the IRS has finished an audit. The Right to Privacy. Taxpayers have the right to expect that any IRS inquiry, audit or enforcement action will comply with the law and be no more intrusive than necessary, and will respect all due process rights, including search and seizure protections and will provide, where applicable, a collection due process hearing. The Right to Confidentiality. Taxpayers have the right to expect that any information they provide to the IRS will not be disclosed unless authorized by the taxpayer or by law. Taxpayers have the right to expect appropriate action will be taken against employees, return preparers, and others who wrongfully use or disclose taxpayer return information. The Right to Retain Representation. Taxpayers have the right to retain an authorized representative of their choice to represent them in their dealings with the IRS. Taxpayers have the right to seek assistance from a Low Income Taxpayer Clinic if they cannot afford representation. The Right to a Fair and Just Tax System. Taxpayers have the right to expect the tax system to consider facts and circumstances that might affect their underlying liabilities, ability to pay, or ability to provide information timely. Taxpayers have the right to receive assistance from theTaxpayer Advocate Service if they are experiencing financial difficulty or if the IRS has not resolved their tax issues properly and timely through its normal channels. Taxpayers who own more than one home can only exclude the gain on the sale of their main home. Taxes must paid on the gain from selling any other home. Taxpayers who used the first-time homebuyer credit to purchase their home have special rules that apply to the sale. For more on those rules, see Publication 523. Use the First Time Homebuyer Credit Account Look-up to get account information such as the total amount of your credit or your repayment amount. Work-related moving expenses might be deductible, see Publication 521, Moving Expenses. Taxpayers moving after the sale of their home should update their address with the IRS and the U.S. Postal Service by filing Form 8822, Change of Address. Taxpayers who purchased health coverage through the Health Insurance Marketplace should notify the Marketplace when moving out of the area covered by the current Marketplace plan. Avoid scams. The IRS does not initiate contact using social media or text message. The first contact normally comes in the mail. Those wondering if they owe money to the IRS can view their tax accountinformation on IRS.gov to find out. If summer plans include starting a business, be sure to visit IRS.gov. The IRS website has answers to questions on payroll and income taxes, credits and deductions plus more. 3. Employer Identification Number (EIN). Generally, businessesmay need to get an EIN for federal tax purposes. Search “EIN” on IRS.gov to find out if the number is necessary. If needed, it’s easy to apply for it online. How could new rules — or recent changes in your life — affect what you owe? Learn about steps you can take that could help lower your tax bill. From the Merrill Edge Minute e-newsletter. Tax reform is a key subject of debate in Washington these days. Even if legislation is passed by Congress this year — by no means a sure thing — it’s virtually certain, for a number of reasons, including the fact that 2017 tax rates and brackets have already been established, that no tax changes will go into effect until at least 2018. 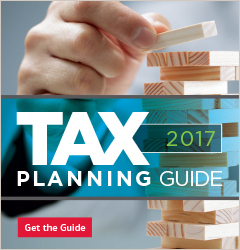 Once you’ve read through the guide, consult with your tax professional to talk about what the latest changes could mean for you.